Keep your Samsung Galaxy S7 Edge safe and secure this ultra tough screen protector from BodyGuardz which is made from the same material used to shield the front of vehicles from rock chips. Fits perfectly with a case. This is the second screen protector I've had. The first said it could be used in conjunction with a case but I'm afraid that was a porky pie. This one works a treat though. It leaves just enough of a gap that the case doesn't touch it and cause it to lift. It also stays on beautifully over the curved part of the screen. This was an exact replacement for an identical product which served its exact purpose when my phone had a fall and got clipped by a tram. A small chip right on the edge finally forced me to get the screen replaced, but it remained fully usable until that moment. This protector is very easy to fit, and comfortable to use. It doesn't go right to the very edges of the curved screen but fits so well that this is in no way an issue. Fits, sticks and stays just as you expect! Great product. 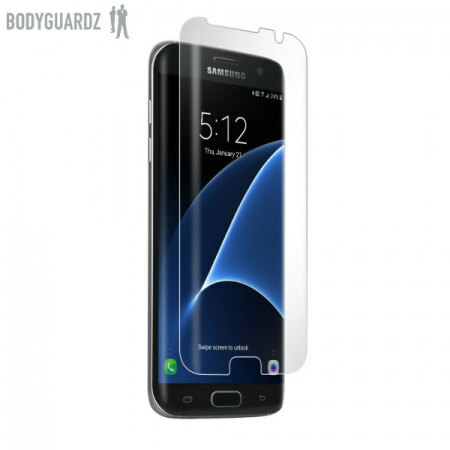 The BodyGuardz range of screen protectors are made from the same material used to shield the front of vehicles from rock chips and provides your Galaxy S7 Edge with unmatched scratch protection from outside elements. By creating a tough barrier between your screen and the world, any damage will be done to the screen protector and not the phone, keeping your device looking good as new. BodyGuardz screen protectors are easy to apply, as they are custom cut for each device. Simply clean the screen with the included microfibre cloth, line up the screen protector with your phone and use the application gel and card to smooth out any bubbles. Once on, the screen protector is practically invisible. While it's important to protect your screen, it's also vital that the screen protector does not hinder your smartphone use by clouding the screen or decreasing the sensitivity of the touchscreen. BodyGuardz screen protectors are specially made to provide optimal clarity, while also being thin enough to keep your touchscreen in perfect working order. Once on, you wont even notice the BodyGuardz screen protector is there. Mobile phones are typically covered in dirt and grime which causes a build up of germs. The specialist anti-bacterial coating helps protect your phone from 99.9% of germ build up on your smartphone's screen. When touching or texting on your Samsung Galaxy S7 Edge you can be sure that you aren't covering your hands in infections. The BodyGuardz Ultra Tough Screen Protector features a slim gap to allow a wide variety of cases to be attached, even with the screen protector installed. This ensures that not only is your screen protected from harm, but the rest of your Samsung Galaxy S7 Edge is also.